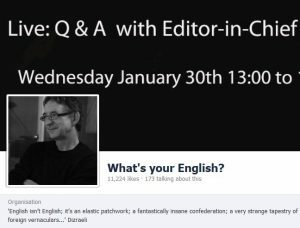 We had a question-and-answer session on Facebook on Wednesday (January 30th), on the subject of online dictionaries. It was a great opportunity to have a conversation with the people who use the Macmillan Dictionary, and to learn more about their concerns and about what they’d like to see in their dictionary. Well over 1400 people tuned in via Facebook and Twitter – which shows how much interest there is. First up, a question from Japan: Samantha Kawakami asked if we had plans for a Macmillan Dictionary iPhone app. The simple answer is yes. We’re planning to develop a range of apps, based on the dictionary but also drawing on other Macmillan data available to us. We’re hoping to launch the first of these later this year – and they’ll be for Android devices (tablets and phones) as well as Apple ones. Another change is happening even sooner. We’ll shortly be providing the dictionary website with what’s called ‘responsive design’: this means the site ‘knows’ what kind of device you’re using (it could be a PC, a tablet, or a phone) and adapts its layout to fit the size of the screen you’re currently looking at. There were a number of questions about how we keep the dictionary up to date – not surprisingly, since we see this as one of the big advantages of digital dictionaries over printed ones. The methodology hasn’t changed dramatically: dictionaries have always aimed to reflect language change, and lexicographers have always had to be alert to new usages. What’s different now is that we have better language resources at our disposal than we had ten or twenty years ago, and we can respond more quickly (instead of waiting till the next new edition). At Macmillan, we’re lucky to be working with Kerry Maxwell, who keeps a constant eye on emerging language trends, covering the most eye-catching of these in her weekly BuzzWords column. Our crowdsourced Open Dictionary attracts a lot of interesting new material too (it currently has over 1400 entries), and some of these get ‘promoted’ to the main dictionary when we do our regular updates. But, as several people mentioned on Facebook, there is more to staying up to date than just adding interesting or entertaining new words. There are basic vocabulary items which have changed their meaning or acquired new uses in the digital age – words such as tablet, tweet, and even like (‘227 people have liked this’). And in fact, our next update will include revised entries for dictionary and encyclopedia – the current definitions, written several years ago, start with the words ‘a book…’! We’ve occasionally talked, in the blog, about how some lexicographic tasks can be automated, and there was a great post by Paul Cook explaining his algorithm for spotting new lexical blends. This is all part of a larger research effort to automatically identify new usages of all kinds, and Macmillan has provided Paul and his colleagues with data on changes we’ve made to the dictionary in recent years. As these computational methods improve, lexicographers will have yet another resource for ensuring they keep pace with language change. Finally on this point, the posts in our blog are another rich source of data. Regular blogger Gill Francis, for example, makes clear that language change isn’t something that happens only at the margins. Gill’s posts focus on some of the commonest and most basic words in the language (such as so, around, and way) and show that even these linguistic building blocks continue to adapt and evolve. Incidentally, our latest update should appear in the next few weeks, and it will include not only new words, phrases and meanings, but also updates to existing entries (like that one at dictionary). A related question came in from the U.S. just on 16:00 GMT – too late, unfortunately, for us to deal with it during the Facebook session. Dawn McIlvain Stahl asked whether ‘the freedoms of an online format’ meant we could now include more or less anything in the dictionary. A good question, and one that is hotly debated in the lexicographic community. We touched on this issue in a series of posts last year, and there are no simple answers. The old limitations of space, imposed by the print format, have disappeared, but they had their advantages: they forced us to have clear policies (based on frequency and usefulness) about what does and does not go in the dictionary. Do we now just say ‘anything goes’, or is it still useful to have robust inclusion criteria? The answer probably lies somewhere in between, but yes, we do still keep some things out – for example if we think they’re likely to be ephemeral. But that’s another benefit of the Open Dictionary: we can accept new items there (even the ones that will probably die out soon) then monitor their use to see if they’re worth adding to the main dictionary. Another topic we discussed was pragmatics, and what dictionaries can or should do to take account of this important aspect of language. We’re sure we can improve on the rather limited coverage of pragmatics in current dictionaries, and the online format opens up some great opportunities for doing this. Multimedia features mean that users could have access to relevant images or YouTube clips, or could listen to the distinctive intonation patterns of phrases – like ‘That is so last year’ or ‘Tell me about it!’ – which encode pragmatic information such as irony or irritation. And hyperlinks could take you from a basic entry to a set of well-chosen corpus examples – often the best way of really understanding the way a word or phrase works and in what situations it tends to be used. So there is plenty to be done on this front. And this issue of hyperlinking relates to another question that came up, regarding the most effective ways of presenting the growing amount of dictionary data without confusing the user. Good design is essential of course, and it’s true that some online dictionaries look horribly cluttered, leading to information overload. I’m generally optimistic about this because most people, and especially ‘digital natives’, seem to have developed smart search skills and are very good at finding what they’re looking for. The key is to make the whole process as intuitive as possible – which often means making things work the way Google does, because that’s what is most familiar, and as an online dictionary we are part of the whole business of ‘search’. One of the most important issues we discussed was how, as a dictionary publisher, we can continue to cater for people in less privileged environments, where Internet access may be expensive or just unavailable. This is something we’ve given a lot of thought to, and the whole question of ‘connectivity’ to the Web came up frequently in the discussions that followed our decision to go ‘digital-only’. The global picture is more complicated than you might expect: it’s not a simple case of richer countries being well connected, and poorer ones less so. A friend of mine who teaches in a university in France tells me that most of his students don’t have Web access in their homes, yet there are many less wealthy countries (in Africa, for example) where governments are investing heavily in fibre-optic infrastructure to ensure fast Web connections. But all the evidence shows that progress towards widespread and affordable connectivity is not only continuing but accelerating. It is worth saying, too, that buying a printed dictionary is not necessarily the least expensive option (especially if you have to buy another one every time there’s a new edition): in many parts of the world, cheap phones and low-cost Web access make an online dictionary the more affordable choice. Finally, Penny Hands asked: “Do you think learners lose anything by not having the dictionary available in book form?”. Well, some people commenting on our decision lamented the loss of opportunities for browsing, but I don’t feel this is a strong argument. Firstly, most people go to a dictionary because they need to resolve an immediate communicative problem – not because they want to spend hours leafing through the book and making unexpected discoveries. In any case, online media provide far more scope for jumping from one entry to another, as anyone who uses Wikipedia will know. Add to that the online thesaurus and the fact that you can click any word in an entry and go straight to the entry for that word, and it’s clear that online dictionaries are more ‘browseable’ than printed ones. So we will stick to what we said when we made our announcement, that dictionaries have now found their ideal medium, and that any disavantages of digital dictionaries are massively outweighed by the benefits they bring. Which seems a good point to end on. Many thanks to everyone who took part in this discussion. I hope you enjoyed it as much as we did (despite my non-existent Facebook skills). It’s been really useful for us, and we must do it again some time. Thanks for a stimulating discussion and for the very useful summary above. The future is looking exciting again for dictionaries!